Bird feeders in your back garden or at a school bring children closer to nature in a simple yet effective way and it teaches them a few important life lessons, like caring for something other than themselves, learning about different kinds of birds, what they eat and their function in the greater scheme of things. Also during school holidays you can have them build their very own feeder and decorate it or prepare specific ‘recipes’ to attract various species. The general consensus for most is that 2016 has been one heck of a year and as we near the end of it families seem to be finding ways to enjoy the more simple pleasures. 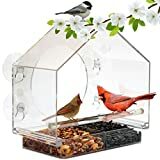 If you’re lucky to live in a town or city where you can pop out for long walks in a forest or wooded area and enjoy the sounds of running water and birds chirping in trees that’s a huge plus, but if not you might need to find a way to get the birds to come to you. Birds serve several purposes from pest and weed control to pollinating flowers and spreading seeds. Occasionally our garden is overrun with unwanted guests like pesky pigeons, but it’s also a good lesson about living in harmony and how we can all get along. Of course, if you really can’t stand them your next class project can be building a scarecrow. We’ve put together a list of our favorite bird feeders including a handheld hummingbird feeding kit to a feeder fit for a feathered princess. The Perky-Pet Copper Panorama Wild Bird Feeder is a popular choice because of the way the seeds are dispensed; once the tray feeder is full the seeds stop dispensing, as birds help themselves to the delicious seeds they slowly fall through. It’s easy to clean and even easier to fill. Of all the bird feeders, this is probably my favorite. I’m a mum. I’m getting old and nostalgic and that’s probably why the Build and Paint Bird Feeder appeals to me so much. The artistic ornithologist can design his or her own feeder and show it off in the garden or gift it to someone who would appreciate it. The nifty little bird feeder is easy to assemble and it comes with four colorful paints and a paintbrush. How awesome is this? 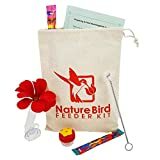 Nature Bird’s Hummingbird Hand Feeding kit will have these gorgeous little birds literally eating out of your hand. The entire family will love having these cute-as-a-button little birds up close and personal. Ideal for bird watchers, gardeners, children, nature buffs and anyone else who can appreciate a truly magical moment. 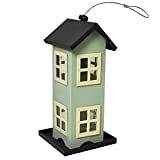 The Townhouse bird feeder is perfect for feeding smaller birds that visit. It holds up to two pounds of seed and has four feeding ports. The only problem I foresee with this homely little feeder is the number of birds that might want to take up residence. Inviting birds over for mealtime means you’re also extending the invite to pesky squirrels but the window bird feeder is almost 100% Mr Nuts proof. The see through design fits onto any glass window, which means you can watch the birds feeding from inside your home so there’s no chance of frightening them away. As far as bird feeders go, it’s easy to refill so little ones can help with this chore and the trays can hold up to two cups of bird seed. Easy to fill and clean the No/No Cardinal Wild Bird Feeder is pretty enough to hang in the front garden or out back. It has a large feeding area for a variety of birds and the durable metal stands up to Mr Nuts and his pesky pals. The feeder is easy to fill and clean and is sure to keep bird, and you, happy all season long. If you’re tired of traditional bird feeders you might like the barn feeder. 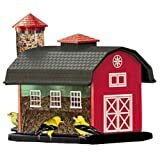 The nostalgic red barn feeder can accommodate different types of seeds; 6 lbs of mixed seed in the barn and the silo can hold up to 1 lbs, and the interchangeable plugs for the silo means you can use general purpose seed or thistle seed. I have one of these in our back yard that we’ve pole mounted. More a work of art than a bird feeder, the Chapel Wild Bird Feeder can hold up to 3.6 lbs. of seed and has a gorgeous natural design with leaf print windows. One of six feeders available in the Betsy Fields Collection, the poly-stained glass seed compartment windows make it easy to monitor the seed levels and lets you see when it needs cleaning. Just in time for the holidays the No/No Solar Snow Man Wild Bird Feeder; it can hold black oil sunflower or safflower seeds, which are dispensed through the metal-mesh design. The classic snowman-like features include three white spheres, a smiling face with button eyes and a black top hat. It glows in the dark because of the solar powered LED, which adds to holiday festivities. Big enough to feed up to 15 birds at a time, the bird feeder is easy to clean and, yes you guessed it, squirrel-resistant. Have you got any foolproof and fashionable feeders in your garden? Share your pictures or send us your birdfeed recipes below and help get the kids excited for feeding their feather friends! Feature image courtesy of Flickr, markbyzewski.